Black Apple (aka. Yellow Buttonwood) is the largest of all the local bush tucker fruits. The actual fruits resemble apples or plums in both size and appearance, and may be eaten raw, direct from the tree when ripe. It is a rainforest species native to Queensland and New South Wales, prized as one of the best carving woods in Australia. The first flowers are female, appearing in the Spring, with male flowers following shortly after. The fruit darkens as it ripens, turning shiny and purplish-blue or black in Summer (September to November). 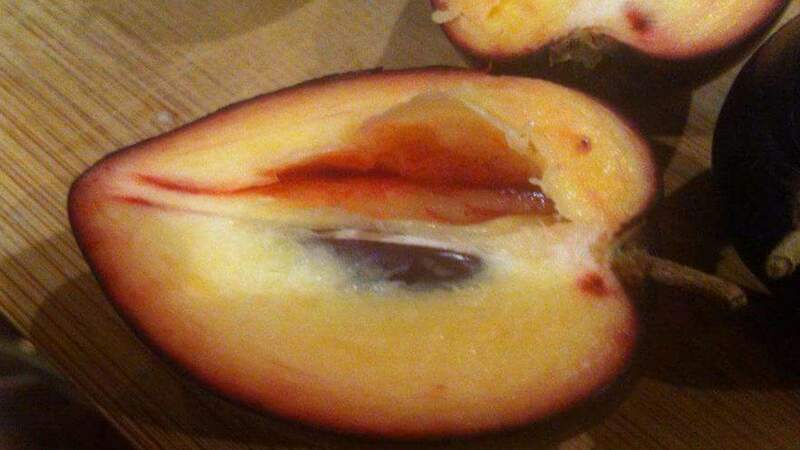 Its fibrous white flesh is tinged with purple-red hues and is sweet to the taste. Each fruit contains 3-5 brown seeds, 2cm long. Black Apple is mostly used fresh, and makes for great pies and cobblers. The fruit can also be used for juice, vinegar or cider. After harvesting, the flavour is predominantly sweet and tart. As a rainforest tree, the Black Apple may be grown in full sun or part shade, but protect from the afternoon Summer sun while it’s still young. It prefers soil with good drainage, and responds well to good soil moisture and extra fertilising. In its native rainforest conditions, it can grow up to 25m in height, but will likely reach between 10-15m in a domestic garden. With adequate pruning, it may be kept in a pot. Why are the leaves of my Black Apple are turning brown/black? Help! Maggots are attacking my Black Apple fruit. What can I do? As a sweet and fleshy fruit with a soft skin, Black Apple may attract fruit flies, so it could be worth wrapping individual fruits as they grow. Inspect your tree regularly for fruit fly larvae, and set traps to catch mature insects. Why is my Black Apple not producing flowers or fruit? Your plant may not be getting enough sunlight in its current spot; try shifting it to a sunnier position or moving shade objects to allow more light through. Otherwise, your tree may just not be mature enough as it takes 3 to 5 years to get to fruiting age.